Winter tyres, or cold weather tyres as they are also known, will be the key to keeping Britain moving over the cold months. This is thanks to their specialist compound and tread design which provides drivers with superior grip and control in wet and dry conditions once the temperature dips below 7°C. Cold weather conditions aren't just about snow and ice. For the last 50 years the UK’s mean temperature during winter months has consistently been 7°C or below. Met office data shows that the average temperature levels can remain at below 7 °C for six months making cold weather tyres suitable for use from October – March. 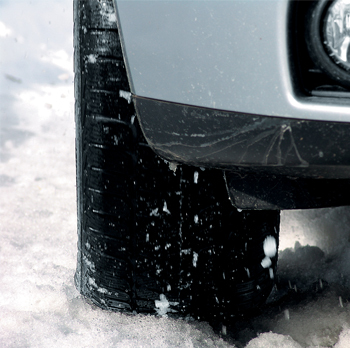 Cold weather tyres feature a different compound & tread pattern to give them extra grip in cold, wet icy conditions. Summer tyres in the same conditions become harder& less ‘elastic’ reducing performance. set of winter tyres to avoid any delays in getting your tyres fitted and remaining safe on the roads. Tanvic Tyre and Service Centre stock an extensive range of Winter Tyres at very competitive prices. Buy your next first or next set of Winter tyres online via our online shop. Tanvic Tyre and Service Centre will supply you with your winter tyres but they can also store your summer tyres in our 'Tyre Hotel' during the cold weather, charges may apply.